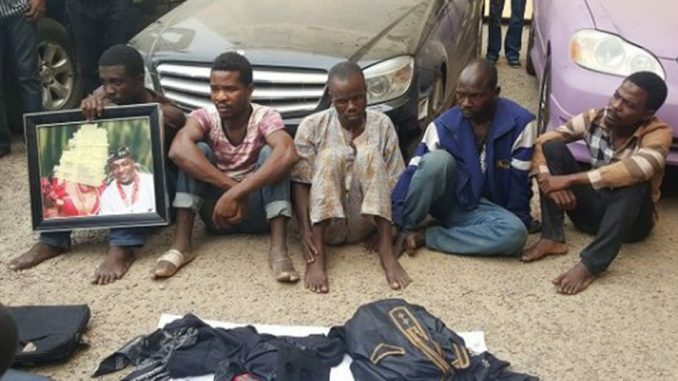 He is said to be the leader of a robbery and car snatching gang that operates in various areas of the Federal Capital Territory (FCT). “I alerted members of the public last year about the activities of an armed robbery gang whose modus operandi is to gain access into the houses of their targets by blaring their horns at the gates. “These criminal elements that normally operate in the early hours of the evening, drive in heavily tinted vehicles, when they get to the entrance of their target houses, they will blare the horns of the car, the gatemen will assume that they are family members or friends, the gates will be flung open and they will get inside and rob the occupants of their cars and valuables especially jewelleries. “I am happy to tell you today that the FCT Command busted one of the gangs responsible for such evil acts. “The gang is led by one medical doctor, Dr. Ola Solomon Jimade, the proprietor of Vital Care Hospital in Kubwa who is presently on the run. Notwithstanding, five members of the gang have been arrested for the various roles they played in the commission of the crime and they are cooperating with the police. “The arrest of members of the syndicate was sequel to a reported case of armed robbery incident at a house in Maitama in November 2017 where a BMW X6 vehicle, large quantities of gold and other valuables worth millions of naira were carted away by the syndicate. “Upon the receipt of the report, the Command through the Specia1 Anti-Robbery Squad (SARS) commenced discreet investigation which led to the arrest of the suspects and recovery of the robbed BMW X6 vehicle. “In the course of investigation so far, five vehicles that have their colours changed have been recovered out of which four have been identified by their respective owners that were robbed at gunpoint in various areas of the city.